A sparkling career-best 156 from Jack Taylor and a five-wickets haul for Craig Miles saw Gloucestershire wrap up victory inside two days against Northamptonshire at Cheltenham. Having gone in at number eight, 23-year-old off-spinner Taylor turned the game with the bat after his side had slipped to 108 for six in reply to 246. He faced only 125 balls, hitting 14 fours and 5 sixes before being last man out in a total of 372, having comfortably exceeded his previous best first class score of 120, made against Derbyshire at Derby earlier this season. Taylor received good support from Benny Howell (36) and Craig Miles (41) as Gloucestershire built a first innings lead of 126 against a Northants attack deprived of Steven Crook, who was injured in mid-over when hit on a knee by the ball and had to leave the field. Then Miles got to work, claiming five for 28 from 10.1 overs as the visitors were skittled for 160 in their second innings, only Richard Levi (64) offering significant resistance as James Fuller and Liam Norwell weighed in with two wickets apiece. That left the home side needing just 35 to win, a target they achieved in six overs for the loss of Chris Dent. Gloucestershire took 23 points from their third LV=County Championship win of the season, while Northants had to settle for four. The start of the day had seen the hosts resume on 82 for four in their first innings. The impressive Olly Stone (four for 91) took two wickets in a sharp opening burst from the College End to put them in deeper trouble. But Taylor and Howell then added 113 in 20.1 overs to turn the game on its head in exhilarating fashion. At lunch Gloucestershire were 225 for seven and the match appeared in the balance. Taylor was 74 not out, having driven Graeme White’s left arm spin straight for his first of his sixes, the second maximum coming when he hooked the returning Stone into one of the marquees at the College Lawn End. While Taylor’s aggression spearheaded the counter-attack and brought him an 86-ball century, Howell, who made 36, was not far behind his partner in terms of intent and it all made for excellent entertainment for a good-sized Festival crowd. Miles hit 7 fours, coming in at ten. Then he and Norwell ran through the top order in the Northants second innings, sharing the wickets equally as the visitors plunged to 18 for four. 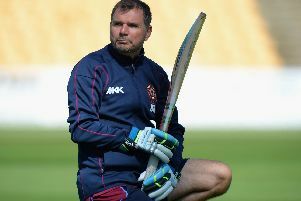 Miles removed openers Stephen Peters, who bagged a pair, and Ben Duckett, while Fuller accounted for first innings centurion Alex Wakely and Rob Keogh. Levi counter-attacked with a 56-ball half-century, including 9 fours, but wickets continued to tumble at the other end. Adam Rossington holed out to Fuller at mid-on off Norwell, who also had Crook caught behind. In between those wickets, Howell weighed in with the scalp of Josh Cobb as Northants stuttered to 97 for seven, still 29 runs behind. Levi appeared relatively untroubled in moving to 64 before being last man out, with only Rory Kleinveldt (37) offering any support.